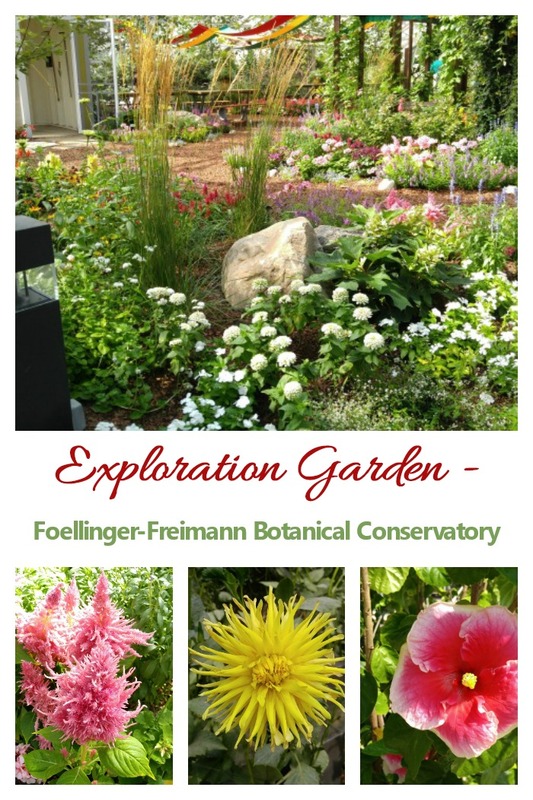 Surround yourself in nature in the 25,000 square foot gardens of Foellinger-Freimann Botanical Conservatory. 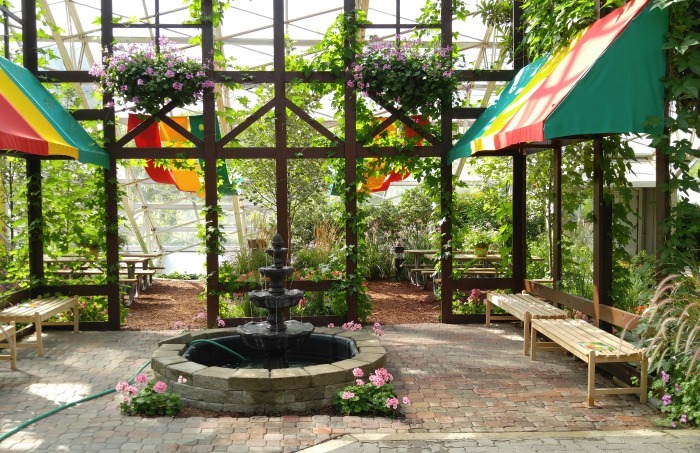 This enclosed conservatory is an oasis nestled in the down town area of Fort Wayne, Indiana. The gardens feature tropical displays, waterfalls and a Sonoran Desert display with over 72 types of cacti. In all, the gardens boast over 1200 plants (over 500 species!) of different species and is a pure delight to visit. If you enjoy both succulents and tropical plants, and love to tour Botanical gardens, you will really like this place. There are three main gardens in this conservatory that are contained inside the walls. The outside of the building is also lavishly decorated with potted and in ground plants for a great outside atmosphere. Outside the main building are three additional gardens, each with its own style and theme. 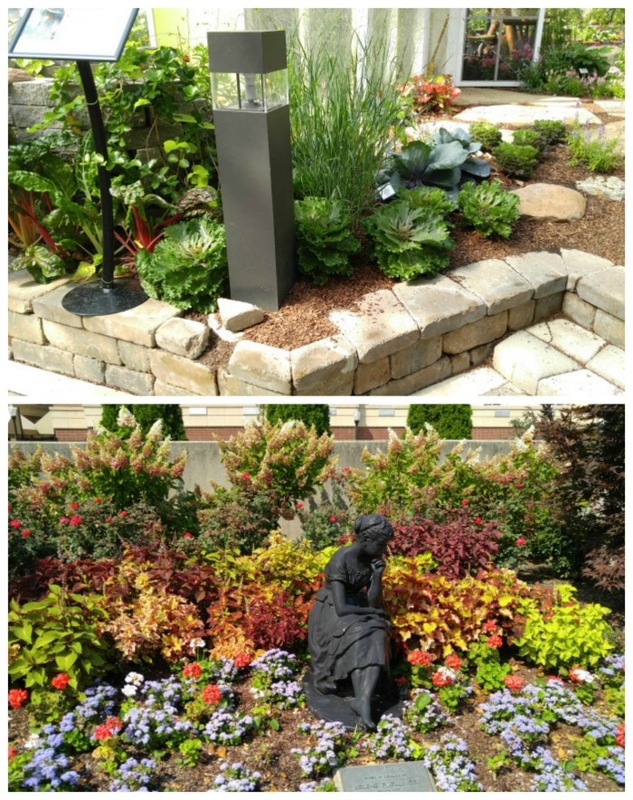 The showcase garden changes throughout the calendar year, depending on what is in season. It has four seasonal exhibits as well as a butterfly garden in the spring. The entry to the showcase garden is through a spacious atrium. It gives an idea of the spectacular views that are to come in the different areas of the conservatory. 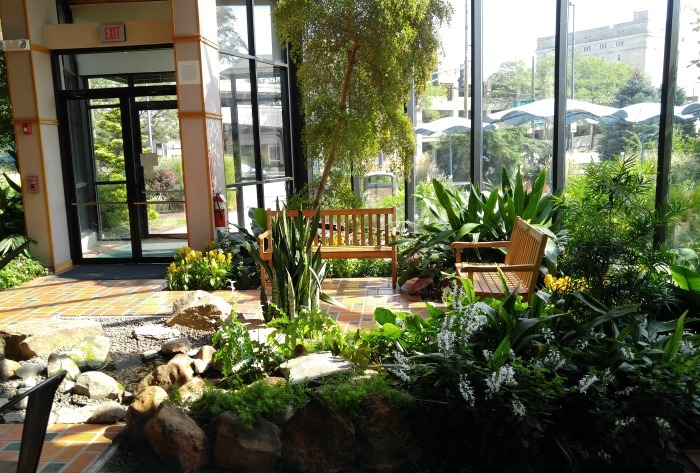 The atrium features lush vegetation and a large fountain, with ample seating areas, as well as a gift shop. The large glass windows let in ample light, so the setting is impressive with a large number of plants. The tropical garden is full of lush greenery. 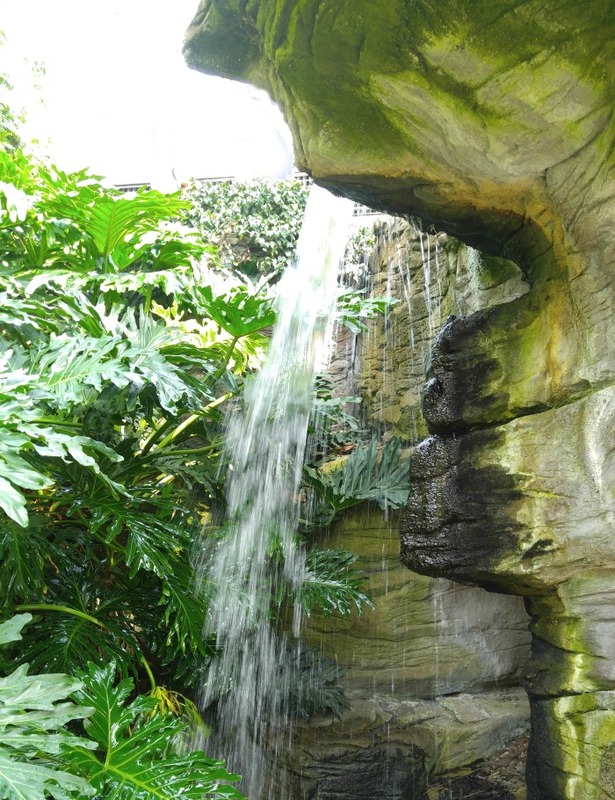 It contains a large indoor waterfall, a goldfish pond and 13 different types of palm trees. 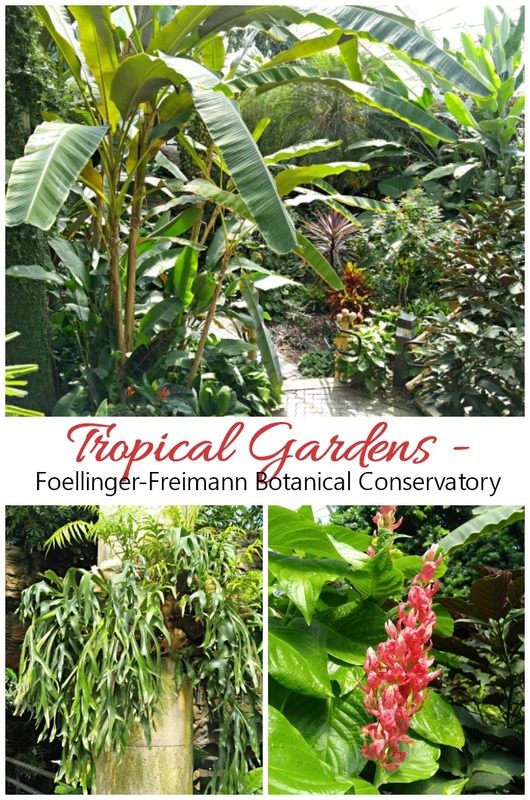 There are many varieties and species of tropical plants, including banana and orange trees, lots of bromeliads and orchids, as well as ferns, cycads and more. While wandering through this area of the conservatory, it’s easy to forget that you are indoors in a down town building. The gardens do a wonderful job of landscaping everything to make it really feel like the tropics. In the center is the lush waterfall, surrounded by tropical greenery. 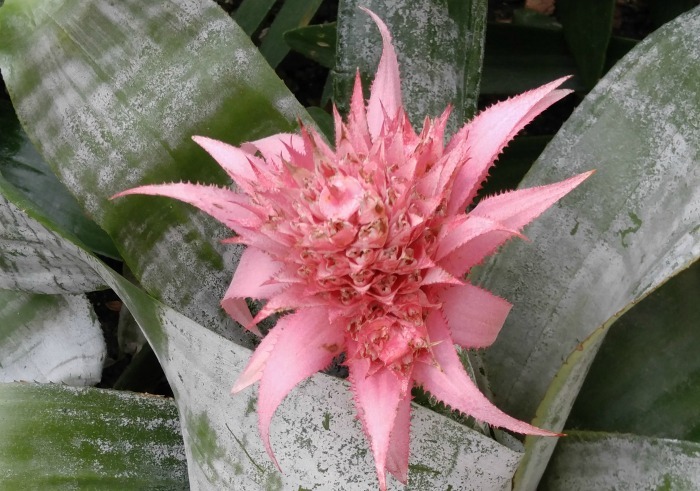 Bromeliad Aechmea Fasciata were in full bloom when we visited and the flowers were amazing. 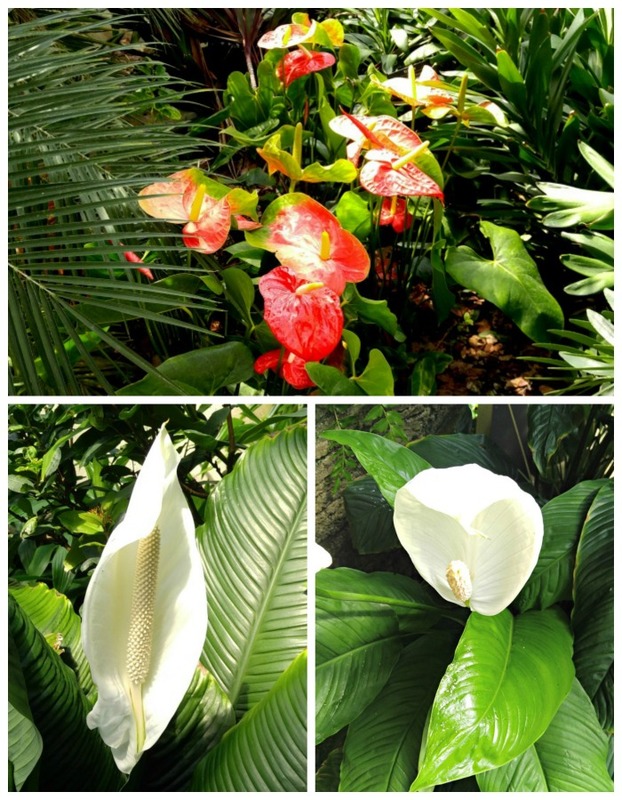 All along the walkways, tropical anthuriums in shades of red and white greeted us. It’s easy to see why their common name is flamingo flower! 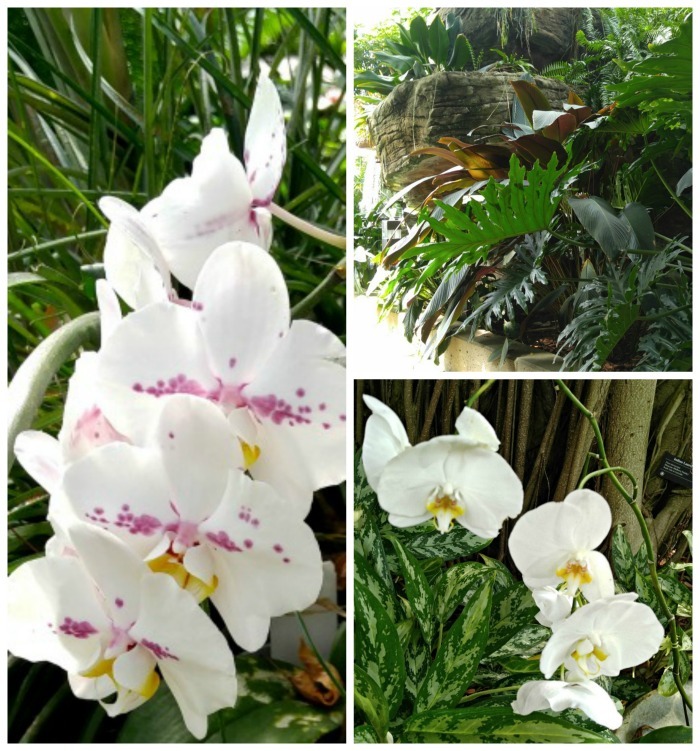 The tropical gardens of the conservatory are just filled with all types of green plants that we normally only see as houseplants and the orchids were magnificent. 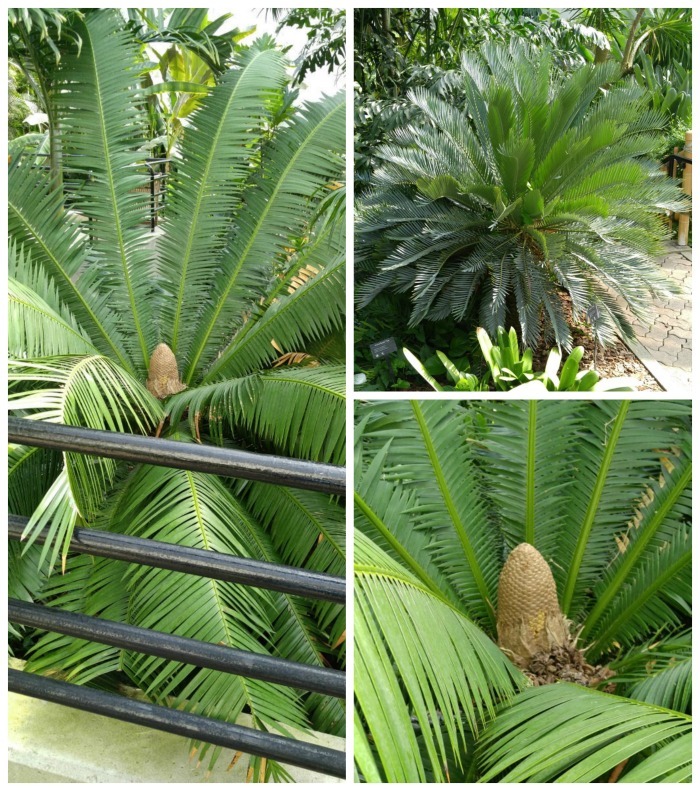 The gardens are well known for their variety of cycads. Some were actually in flower when we were there. This is a sight that we don’t often see, even if we have the climate to grow the plants. 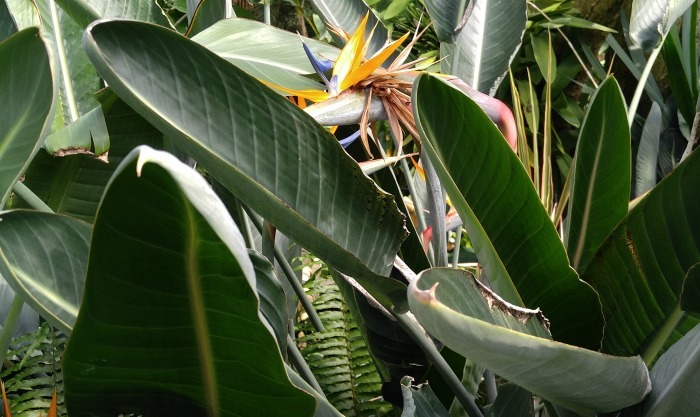 A glimpse of a bird of paradise reminded me of Australia. 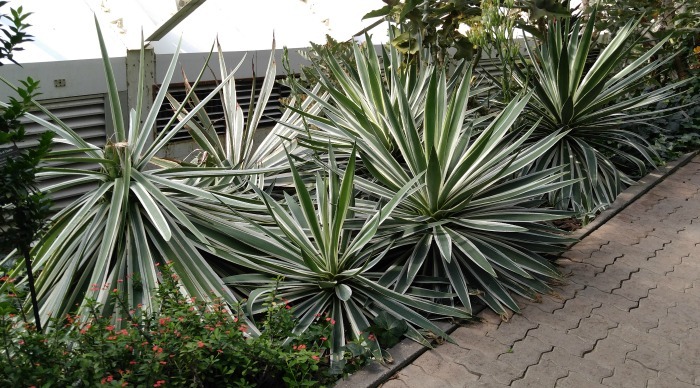 This plant was a common sight there, with its tropical climate, but not often seen in North Carolina! 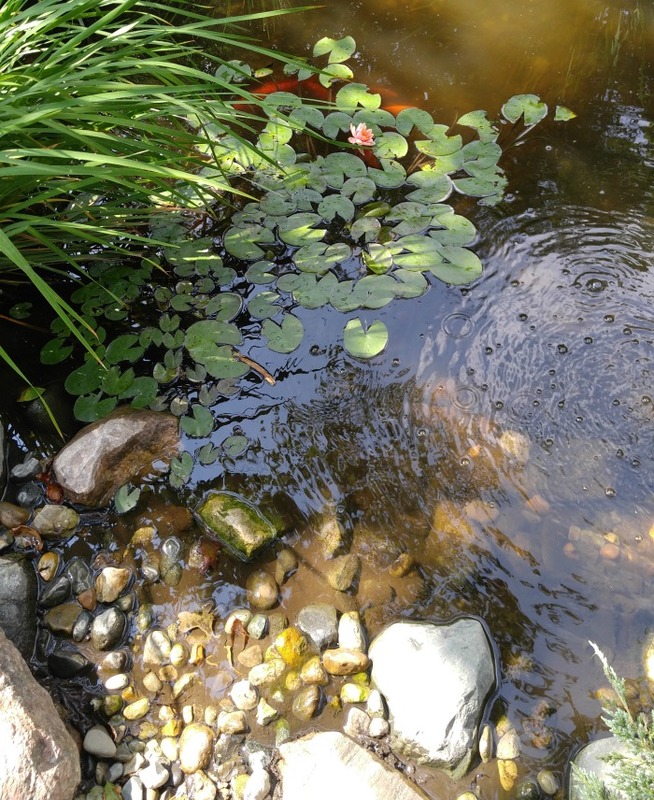 The tropical fish pond was well stocked and is a delight for both young and older visitors. 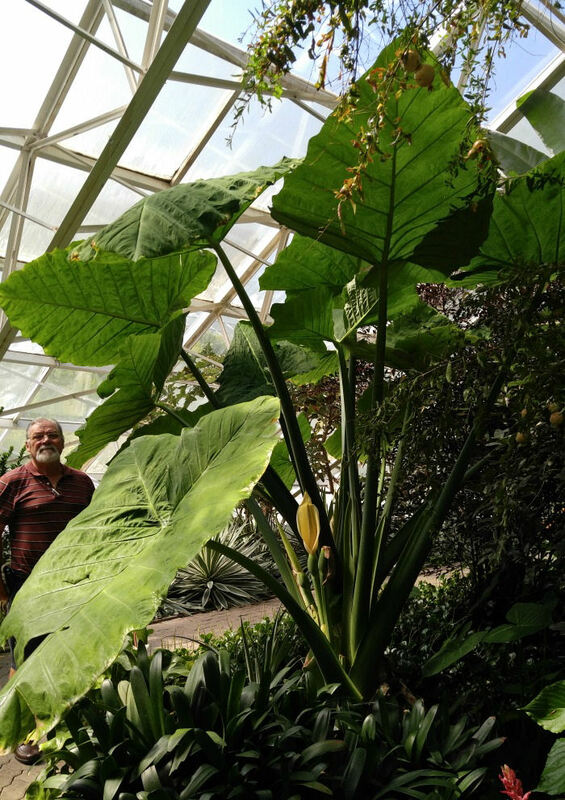 Rounding out our exploration of the tropical garden left us with the thoughts about just how large these common houseplants will grow if the conditions are right for them! My husband was dwarfed by this huge philodendron. 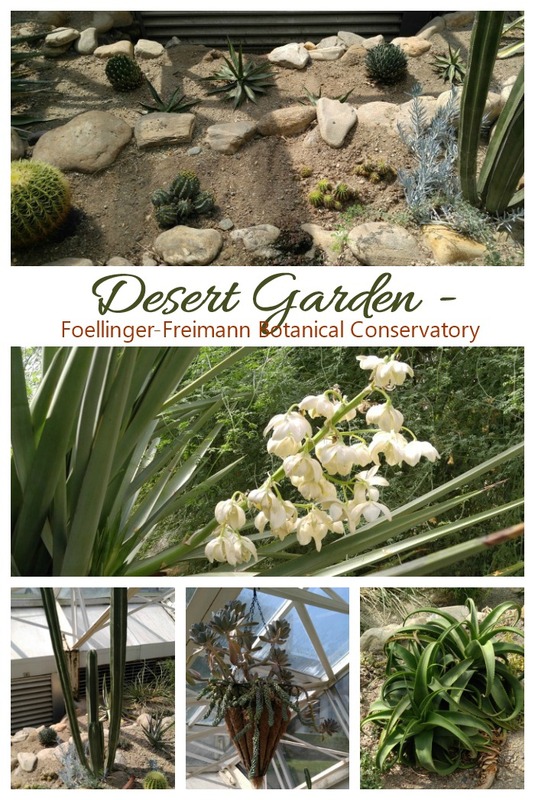 The highlight of our visit to the Foellinger-Freimann Botanical Conservatory was the desert garden. This magnificent display features 3 huge Saguaro cacti and many Arizona specimens, such as prickly pear, agave, yucca and jojoba. 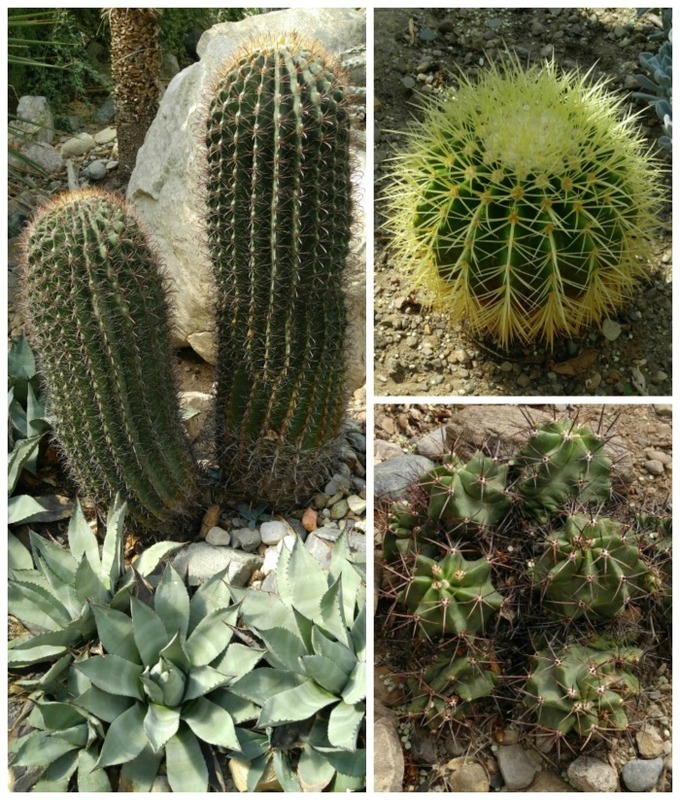 Each variety is identified and the atmosphere is just wonderful for anyone who loves succulents and cacti. 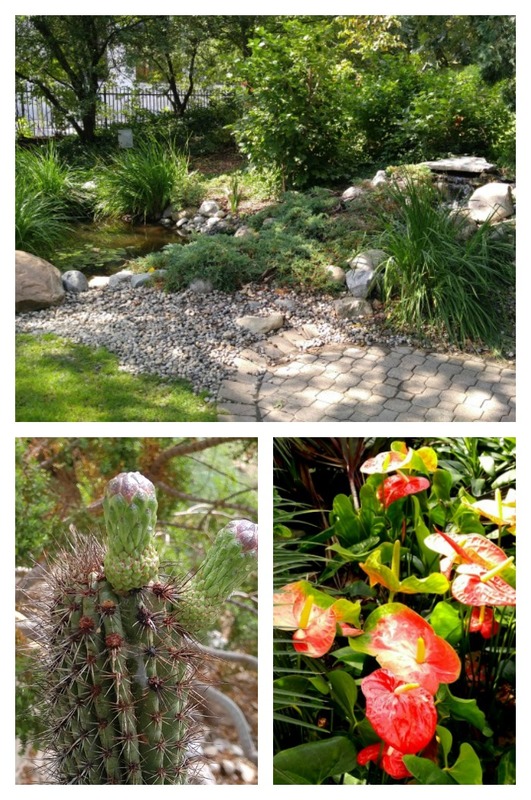 The main focus of this garden is the Arizona uplands known as the Sonoran Desert. Each area of this part of the conservatory transported me to a dry, arid desert setting. As we walked around the displays, it actually felt as though we were in the Southwest part of the USA. As we got closer to the opening to the desert garden, the rows of agave told me that we were in for treat. 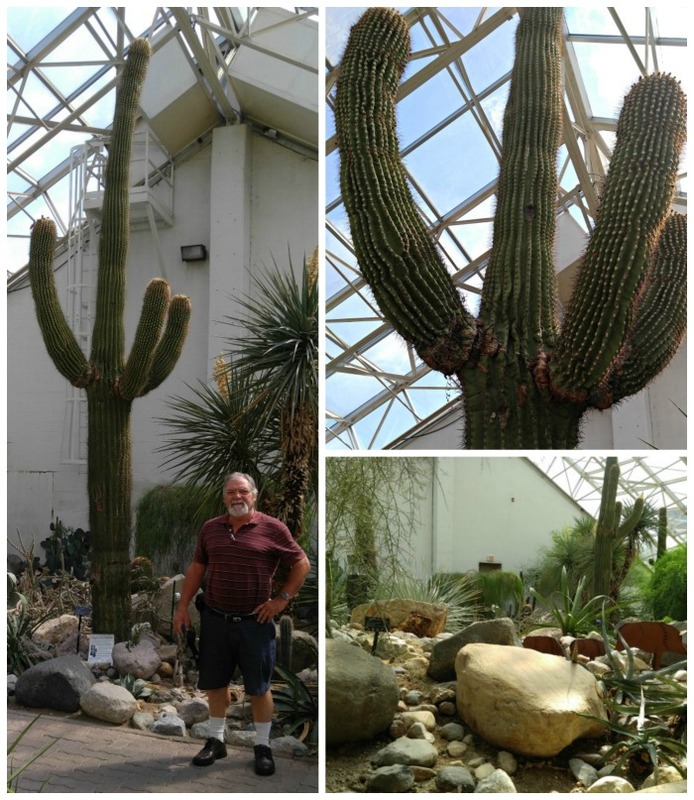 I’ve always had a special fondness and any forms of cacti or succulents and these were in wonderful condition and so large. There were so many types of cacti in this display area with each one labeled by a plaque with its name. 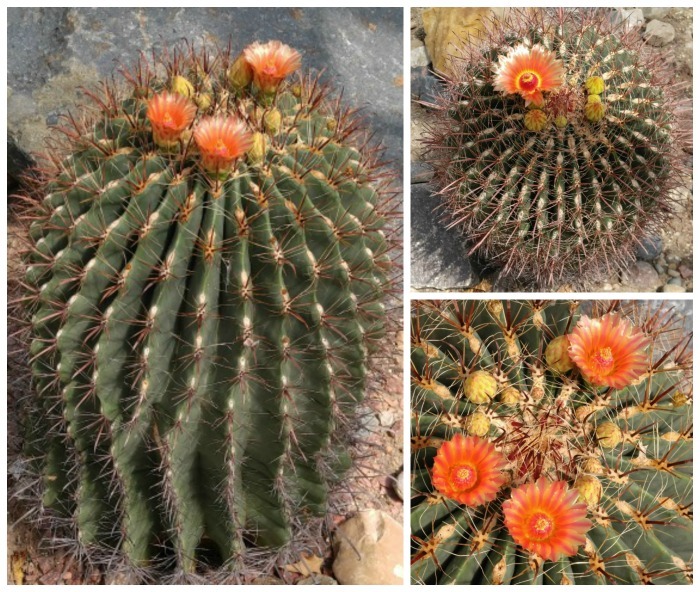 Barrel cacti, claret cup cactus and golden barrel cactus were just a few of them. Some, like this fish hook barrel cactus were even in flower while we were there. Even though I grow cacti at home, I rarely see them flower, so this was a treat. Height was no problem as this organ pipe cactus showed. It was almost ready to flower and was about 7 feet tall. 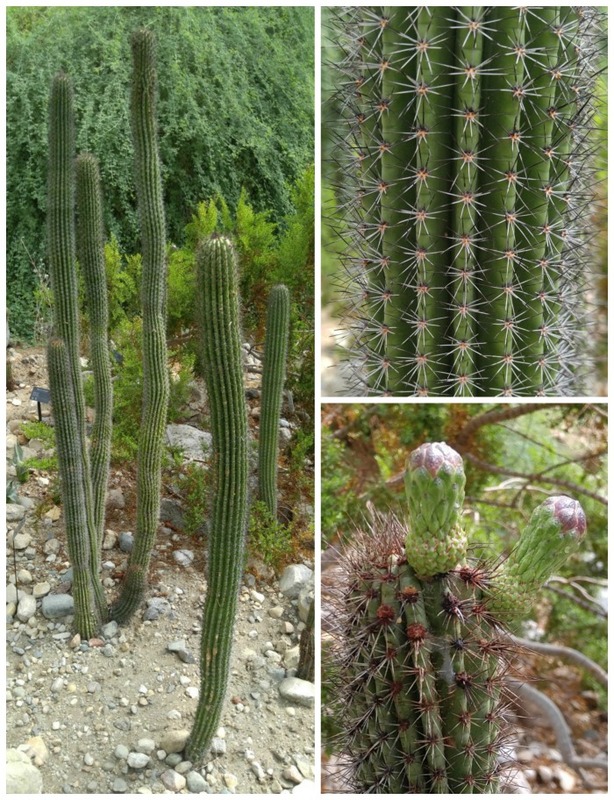 But even though this cactus was tall, it was dwarfed by the giant saguaro cactus. It occupied one display section along with other drought tolerant plants, and reached almost to the top of the arched roof. The glass panels had to be removed to bring it into the desert garden! If you love cacti as much as I do, you’ll be right at home in this part of the conservatory. In addition to the tree main indoor gardens, the outside of the conservatory is also a wonderful place to visit and wander. We stepped out of the desert garden only to discover that we were not done. A large exploration garden and a terrace garden were lavishly landscaped for us to wander through, as well. The two outside areas take up almost as much room as the three main indoor gardens. 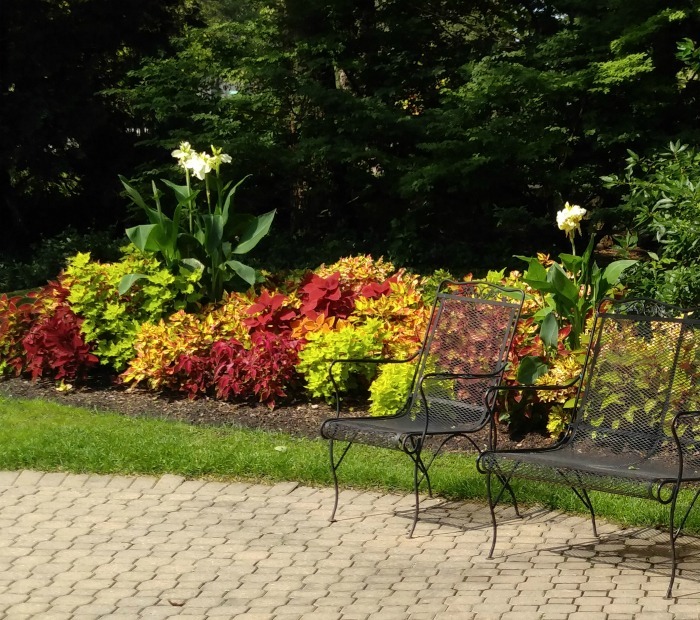 This area is a landscaped park with cold hardy trees and shrubs and is lavishly planted with seasonal flowering annuals and perennials. There are many seating areas in this part of the garden and it’s a great place to stop for a bite of lunch. 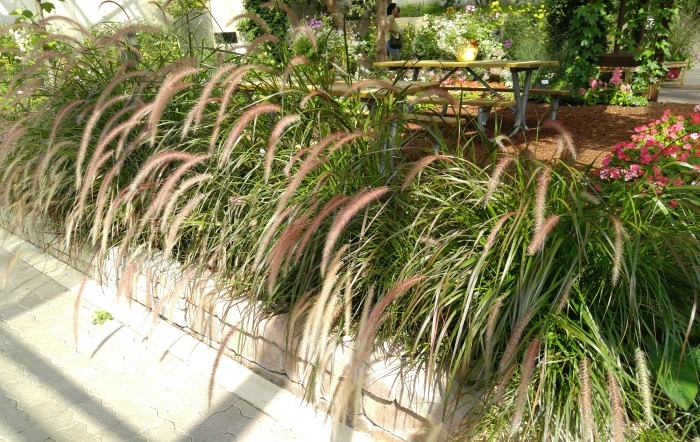 One of the exhibits in this area include the New German Garden, an informal gardens with perennials and ornamental grasses which simulate a wild landscape. This area also contains some allotment gardens of fruit and vegetables which were so popular on the outskirts of the urban areas to allow the poor to raise their own food. 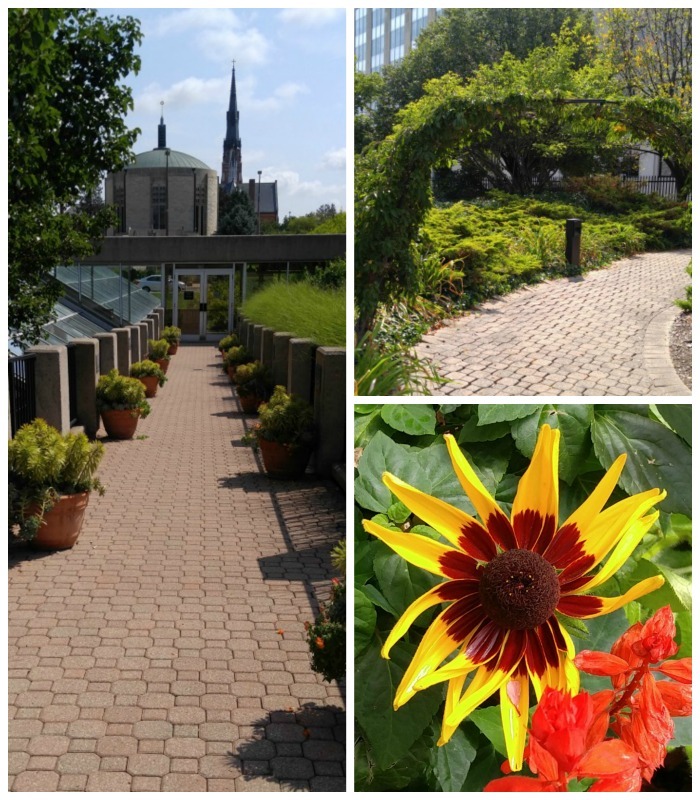 Ornamental grasses, conifers and flowering trees are planted outside of the conservatory along the street sides that surround the building. 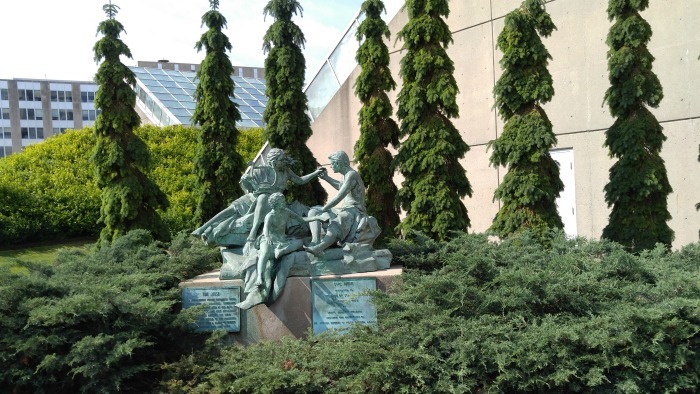 This part of the garden is located at the entry to the atrium which is the first area that you see when you enter the grounds of the conservatory. Azaleas, rhododendrons, and other acid loving plants which are not native to the region are the focus of this part of the garden. The Botanical garden is open Tuesday to Sunday. It is closed on Monday and on both New Year’s Day and Christmas Day. 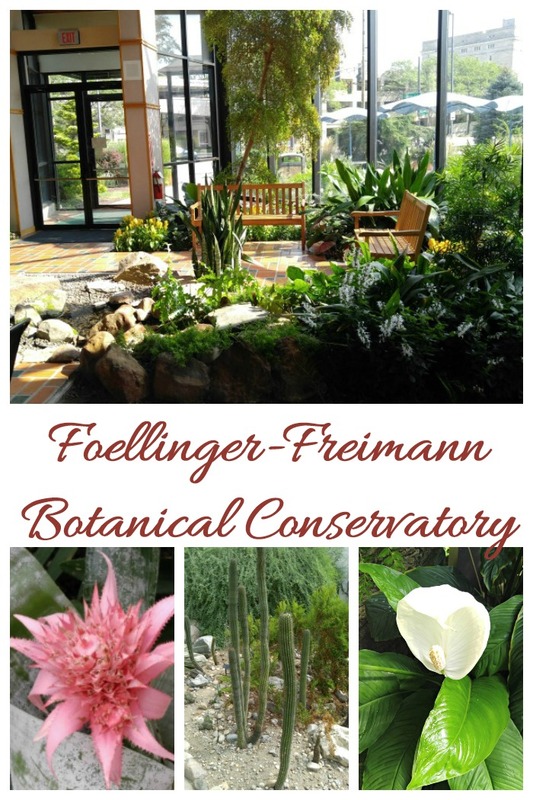 Foellinger-Freimann Botanical Conservatory is located at 1100 S. Calhoun St., Fort Wayne, Indiana 46802. I highly recommend a visit. Would you like a reminder of this post so that you can view it later? Just pin this image to one of your gardening Boards on Pinterest.